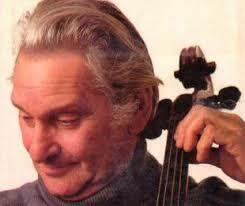 In collaboration with Aldeburgh Music, Robert Cohen has created a celebratory day in tribute to William Pleeth, his teacher and the teacher of many distinguished cellists around the world, most notably Jaqueline du Pré . The day begins appropriately with Robert giving an open masterclass followed by a discussion with rarely seen archival material on Pleeth’s life and music-making. It concludes with a concert of music closely associated with Pleeth and features performances by Robert Cohen, the Fine Arts Quartet and members of the Pleeth family, distingued celiists Anthony Pleeth and Tatty Theo. They are joined by pianist Lana Bode and Robert's own student, the brilliant Nadège Rochat.